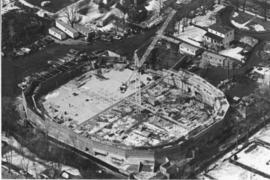 Item is an aerial photograph of Dalplex during construction. 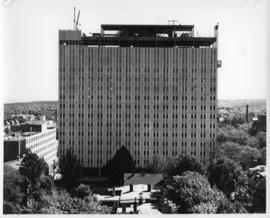 The photograph shows a crane in the middle of the unfinished building. The name "Morris" is written on the back of the photograph. 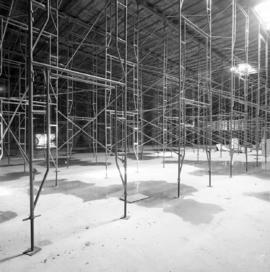 Item consists of two copies of an aerial photograph taken during the construction of the F. H. Sexton Memorial Gymnasium on Dalhousie University' Sexton Campus, formerly the Technical University of Nova Scotia. 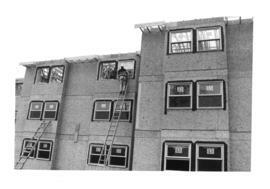 This series contains papers relating to the construction of Ward's house on Beaufort Avenue in Halifax, Nova Scotia. 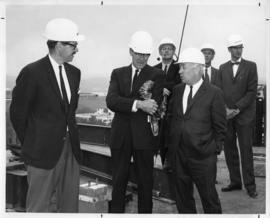 Item is a photograph taken during the cornerstone laying ceremony of the Henry Hicks Academic Administration Building at Dalhousie University. 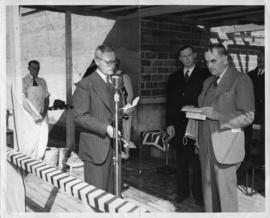 The photograph shows several men standing on a platform with a microphone before laying the cornerstone. 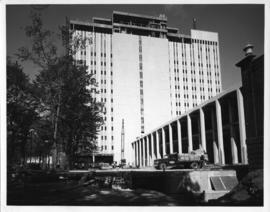 Item is a photograph taken during the construction of the Sir Charles Medical Building at Dalhousie University. 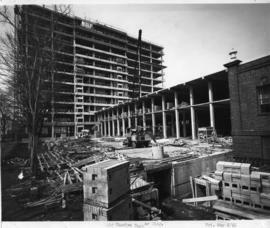 Item is a photograph taken during the construction of the Sir Charles Medical Building at Dalhousie University. 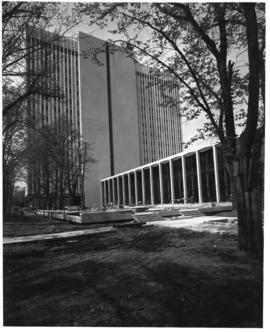 The photograph was taken in Fall 1966. 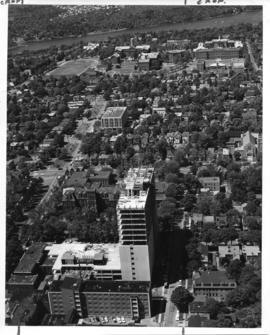 Item is a photograph taken during the construction of the Sir Charles Medical Building at Dalhousie University. 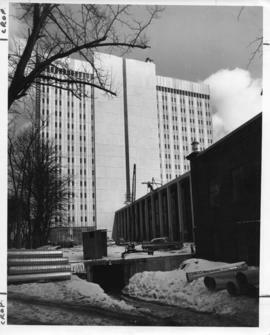 The photograph was taken in the winter of 1967. 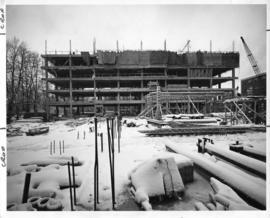 Item is a photograph taken during the construction of Eliza Ritchie Hall at Dalhousie University. 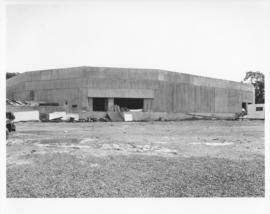 The photograph shows one side of the unfinished building, with unfinished plywood walls. 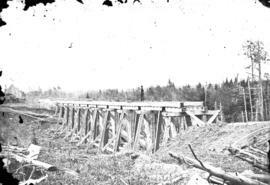 The photograph was used in Volume 17, No. 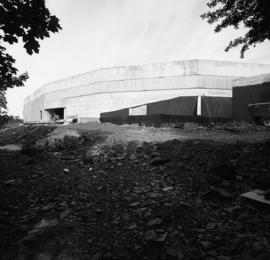 15 of Dal News. 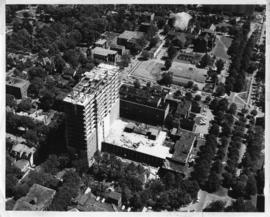 Item is a photograph taken during the demolition of the heating plant to make room for the Sir Charles Tupper Medical Building at Dalhousie University. 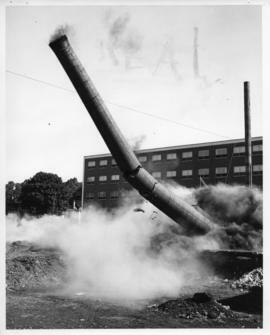 The photograph shows the heating plant's chimney collapsing. 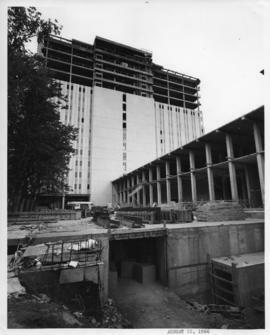 Item is a photograph of construction material lying next to the Dalplex during construction. 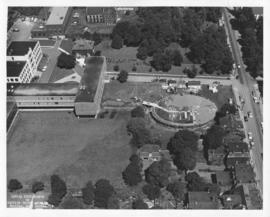 Item is a photograph of Dalplex with some construction material lying around. 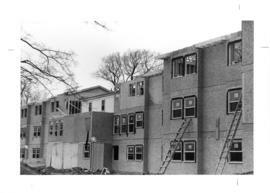 Item is a photograph taken during the construction of Dalplex. 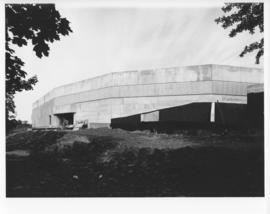 Item is a photograph taken during the construction of Dalplex. The photograph shows metal scaffolding inside the building. 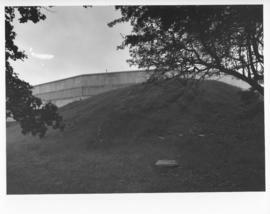 Item is a photograph of a hill and trees next to Dalplex. 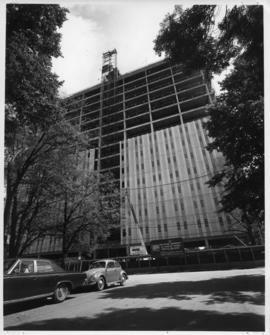 Item is a photograph of Dalplex during construction. 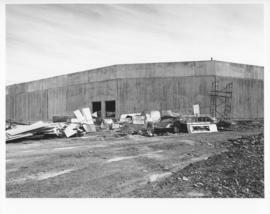 Item is a photograph taken during the construction of Dalplex. 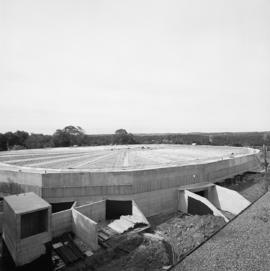 The photograph shows the roof of the building. 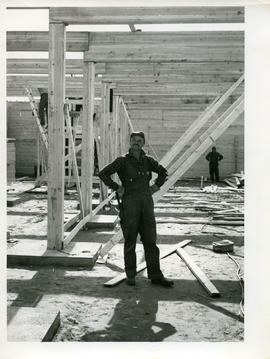 Item is a photograph taken during the construction of Dalplex. 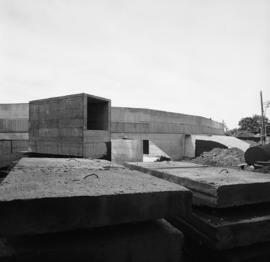 The photograph shows large slabs on concrete stacked by the unfinished building.